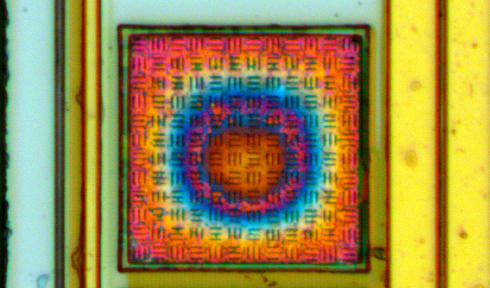 Die Shot of Si8641 Digital Isolator « Adafruit Industries – Makers, hackers, artists, designers and engineers! Silicon Lab’s family of ultra-low-power digital isolators are CMOS devices offering substantial data rate, propagation delay, power, size, reliability, and external BOM advantages over legacy isolation technologies. The operating parameters of these products remain stable across wide temperature ranges and throughout device service life for ease of design and highly uniform performance. All device versions have Schmitt trigger inputs for high noise immunity and only require VDD bypass capacitors. I like to look at these die shots and wonder what else they might be in the real world – like a Rorschach test – and this one totally reminds me of a race track, while the outer pads appear to have diamond plate-like hatching on them.